All in one pill splitter, crusher and storage container. Convenient three-in-one NorcoTM Pill Splitter and Crusher cuts, crushes and stores pill safely. Pills can easily be split in two using the top chamber or crushed to mix with liquids for easier swallowing. 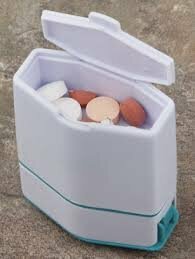 The bottom chamber can be used to store multiple pills and/or store unused portions of split pills. Measures 2-1/4" x 2-1/2" x 1-1/4" (5.7 x 6.4 x 3.2cm). Convenient three-in-one NorcoTM Pill Splitter and Crusher cuts, crushes and stores pill safely. Pills can easily be split in two using the top chamber or crushed to mix with liquids for easier swallowing. Measures 2-1/4" x 2-1/2" x 1-1/4" (5.7 x 6.4 x 3.2cm).